India Stuns Pak: No Handshake, Only Namaste! MEA Joint Secretary Deepak Mittal attended the proceedings in the Kulbhushan Jadhav Case at the International Court of Justice (ICJ). 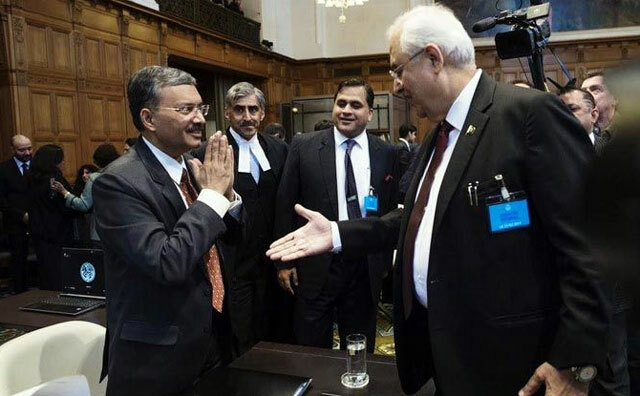 Ahead of the hearing, Pakistan Attorney General Anwar Mansoor Khan offered a handshake to Deepak Mittal. The Indian Official snubbed him and responded with a 'namaste'. The photographer capturing this moment has gone viral on the social media. It's been described as a befitting reply to Pakistan after the suicide bombing which killed 40 CRPF Jawans in Pulwama, south Kashmir. During the court hearing, India's counsel Harish Salve argued that Kulbhushan Jadhav's custody without consular access is unlawful and sought his release citing human rights.